Four cousins of Jean Charles de Menezes have visited the Tube station where he was shot by police, to mark the first anniversary of his death. 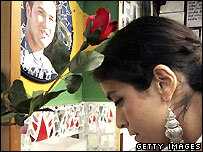 They held a minute's silence in front of a tableau of pictures and poems at Stockwell, in south London. 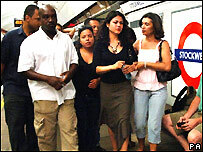 Mr Menezes was shot the day after a series of attempted bombings in London. Prosecutors said on Monday that no officers would be charged over the shooting, which happened when police mistook him for a suicide bomber. However, the Metropolitan Police are to be prosecuted under health and safety laws in connection with the death of the 27-year-old Brazilian electrician, who was shot seven times in the head. His family attacked the decision not to prosecute any officers as "unbelievable" and "ridiculous". The four cousins who visited Stockwell on Saturday were Alex and Alessandro Pereira, Patricia Armani and Vivienne Figueiredo. Their vigil had been due to be followed by a public meeting of relatives and supporters, but that was cancelled because of the Middle East conflict. Family spokesman and Justice4Jean campaign organiser Asad Rehman said some of the Brazilian electrician's family had planned to attend the protest in London against Israel's attacks on Lebanon. "They felt great empathy and asked for people to take up the course for peace," he said. Mr Rehman added: "This is a day of remembrance and a day of great sorrow for the family. "It seems like yesterday Jean was with them and then taken away from them. It's been a difficult year for them. "They're no closer to the truth of knowing why Jean died - that's very, very upsetting for them." Among those showing their support for the Menezes family was Mohammed Abdulkahar, who was shot in the chest during an anti-terrorism raid by police at his house in Forest Gate, London, in June. He said he was very upset no police officer was to be prosecuted over the death of Mr Menezes. "Every day I see my mum and my family going through pain. They're having counselling every day, and myself as well," Mr Abdulkahar said. "And I can't imagine how his mum's feeling." Mr Rehman said there should be no "impunity" for police officers. "It's very, very important that there is an opportunity for the evidence to be tested, for a jury to hear it, and to be able to give a verdict." Two days after the shooting, Met head Sir Ian Blair said: "This is a tragedy. "The Metropolitan Police accepts full responsibility for this. To the family I can only express my deep regrets." Two reports by the Independent Police Complaints Commission into the Stockwell shooting have yet to be published. The Crown Prosecution Service said there was "insufficient evidence" to prosecute any individual over the death of the electrician. On 22 July 2005, a surveillance team had been monitoring a block of flats in Tulse Hill, south London, where Mr Menezes lived, in the belief that a man wanted in connection with the previous day's attempted suicide bombings in London resided there. When Mr Menezes emerged from the flats, he was wrongly identified as the suspect and followed to Stockwell, where he was shot as he boarded a Tube train.